We are proud to have AYCB Label Head, Boys Noize Artists and Berlin Techno legend Housemeister on GND! 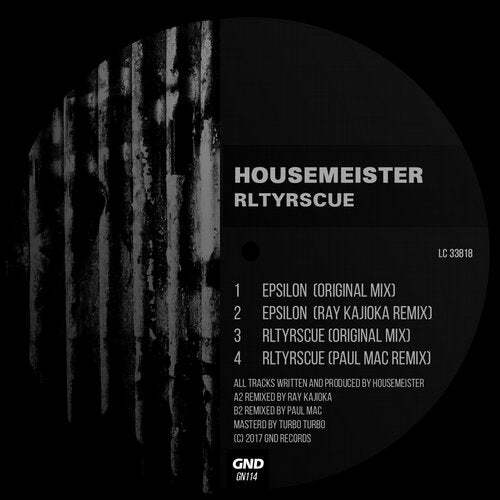 Housemeister delivered us a heavy two tracker with two fantastic remixes. Epsilon is remixed by Kanzerlamt and Cocoon Artist Ray Kajioka. On the flip side we have a smashing remix from the Stimulus boss and UK Techno legend Paul Mac. In combination with these two excellent original tunes, we are proud to release this big record. We hope that you are as much excited as we are about this new Housemeister record!